In very recent years, Japanese scientists have invented a 'synthetic blood' that is capable of fully sustaining a vampire's diet. Sort of like a vampiric 'slim fast'; the drink, now mass marketed under the name TruBlood, has allowed many vampires to come out of the shadows and into mainstream society. Now that humans are no longer an entrée, vampires have "come out of the coffin" to demand their place in society complete with equal rights and citizenship. Religious leaders and government officials around the world have chosen their sides and a full-on political war is in progress. Feeling that they have sat back and watched these battles long enough, many powerful and ancient vampires begin to migrate toward the lush and decadent city of New Orleans, one of the country's strongest vampiric hot spots, where they are drawn by the call of their brethren to meet and discuss what these changes may mean for immortal "life" as they know it. But what will come of such an influx of power and what will it mean for the Vampire Rights Movement? Some are willing to give up the lifeblood that fuels their existence in order to join human society and others will try and take back the night. Which side will you be on? 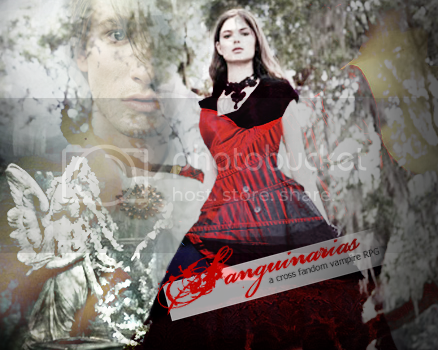 Sanguinarias is a (limited) cross-fandom roleplay loosely based upon HBO's True Blood. Thank you all ahead of time for your time. I'd like to welcome you all to my forum that is called The Savage Garden. Its a little RP community that has recently opened and, is in need of members. This is not spam and, this is a real site where we do not discriminate our members as long as they obey the few simple rules that allows us to keep our forum open. By the way yes we know that the author of this series is no longer popular. The creators of this forum feel that some of the things she has said about her work are a slap in the face to us. However we love the body of work she has created and, just because the author is lost in her own black pit we stand by her characters even if she herself does not. I apologize that we have so many links on this community in such a short time. We're just really looking for new members and, our friend Rebekah posted to her communities. I however am blanketing every community with a like interest. I really hate advertising in a way that seems like we're spamming. Again I apologize and, you will not get another post like this from me for a month or so. Register and have fun posting with the vampires. Hail to all living dead! My mortal's welcome to our humble online abroad.